Louisiana’s “Moderate” relative sea-level rise scenario depends on drastic and swift cuts to the carbon pollution fueling global warming. We in Louisiana have hung our hopes on the State’s Master Plan for a Sustainable Coast, which has integrated protective levees and prudent elevation of our homes with coastal wetland restoration in order to sustain our coastal economy. But how can we hope to sustain any amount of our low-lying land in the face of sea level rise? Many simple, interactive topographic maps of sea level rise in the Gulf region paint an overly grim picture that does not include the potential of the Mississippi River to build land. But those simplistic maps do raise real concerns about Louisiana’s future, should the carbon causing the sea to swell continue to remain unregulated. Louisiana cannot shy away from this threat. In 2009, sea level rise scientists [pdf] wrote the most accurate sea level rise model yet—one that uses data from the actual changes in sea level we see to predict what will happen in the future. Because the polar land ice is already melting, and the sea is already expanding, it is thought that this approach is more accurate than working from theoretical models. And this model has worked extremely well—it has been able to predict, or “backcast” the history of sea level rise based on temperature within a small margin of error. The authors of that paper state that sea level rise will only be moderated if we act sooner than later to regulate carbon—because the ocean stores heat for a very long time. 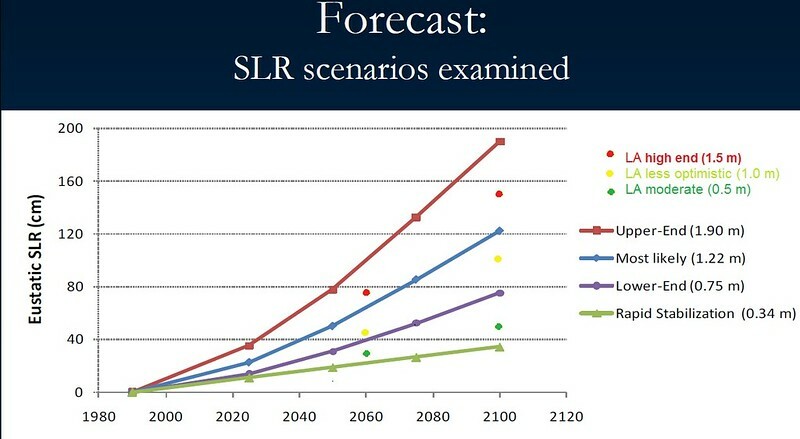 According to the best projections, Louisiana’s “Moderate” scenario for sea level rise assumes that our society and government will swiftly and vigorously regulate carbon. Even the “less optimistic” scenario is rather optimistic. We at GRN believe that the worst case scenario has many policy implications. But it points to Louisiana’s dire need for drastic carbon regulation—which, after all, could fund construction of coastal wetlands that sequester carbon. Louisiana currently has a “high-end” scenario that is not the worst-case. But even this “high-end” scenario is absent from the public documents that the state has presented. How much land is built is determined largely by how high sea level rises. If the goal is to "build land," it seems that swift carbon regulation is necessary. We in Louisiana can't hedge about this threat if we want to be national leaders in adapting to it. For the sake of the public trust, and being honest with our public creditors, the state of Louisiana cannot be silent about the importance of carbon regulation when talking about building land via coastal restoration.